Gosh, they’ve grown quickly, haven’t they? From cruising in the playpen to romping around the backyard, you’ve documented hundreds of endearing moments of discovery and playtime. And now, they’re sprinting up and down soccer fields, racing up and down the swimming pool or swinging a wooden bat with all their might. Photographing kids’ sports is a fun endeavor. If your kids are like mine, they can’t wait to see themselves in action. 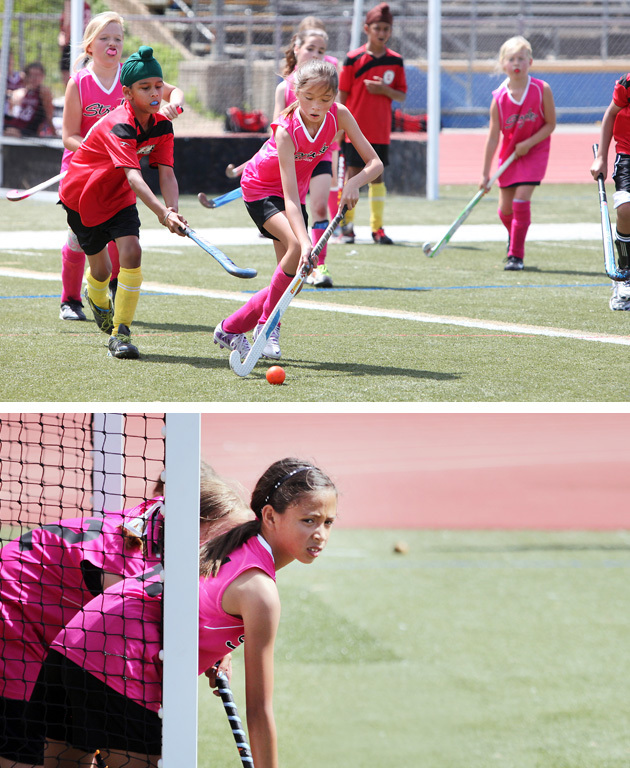 So, here are a few easy tips for capturing your kids’ best athletic moments. Put your camera in sports mode – it’s usually the Running Person on the main dial of your DSLR. This will automatically set the shutter speed high to freeze the action. Alternatively, you could use the semi-auto mode for shutter priority (Tv on the main dial) so you can set the shutter speed where you like it – I usually use 1/1000 of a second but you could go as low as 1/500. The camera will figure out the appropriate aperture and ISO to achieve the correct exposure. Take a few shots and check if you’ve sufficiently frozen the action. If not, just keep dialing up the shutter speed. Because there’s a lot of action, you should keep your camera on continuous or burst mode. Several frames will be taken when you press the shutter so that you have a better chance of capturing the right moment(s). I’m often asked what the best lens is for photographing sports and honestly, it really depends on the sport and how close you can get to the action. I mostly photograph soccer and field hockey games right now so I prefer my 100mm-400mm lens. However, my 70mm-200mm has worked well for those shots along the sideline or across the shorter width of the field. I’ve also used my 70mm-200mm standing outside of the arena for my daughters’ horse shows. Know where your light is coming from so you can decide where to best position yourself. On bright sunny days, it’s easy to light up your subject by making sure that the players are facing the light (sun). This light can be harsh, causing stark contrasts of light and shadow on your players’ faces. Sometimes this works well with the drama of the action and sometimes, you’d like to see more of the tense facial expression. This is a creative choice; so see what works for the images you’re creating. Or take a different approach and make sure the light is behind the players. This could result in images with a bit of rim light around the player as well as more even lighting across the player’s body and face. As the light starts fading in the late afternoons, you’ll need more light on the players. Try bumping up the ISO or using a flash. A clean, uncluttered background will really make your player stand out in the photo. So, take a look at what’s in the background of your shots and change your position if necessary. If this isn’t possible because you’re at a very busy venue, as for most soccer tournaments, you could blur the background by using a wider aperture – set your main dial to Av (aperture priority) and try f/4 or f/5.6. The camera will set the shutter speed and ISO for the correct exposure. It really helps to know the sport so that you can anticipate the action. For example, in soccer, when you know that the player is about to kick the ball, press the shutter release all the way down just before the ball is kicked. This way, you’ll be sure to capture the player kicking the ball with the ball still in the frame. The most interesting sports action shots are when the player is facing straight toward the camera with the ball in the frame. At soccer games, my favorite spot to stand is along the end line on one side of the goal. Here, I wait for the action to come to me as the plays are designed to bring the ball toward the goal. Filling the frame with the player’s body is always a great individual action shot. In addition, the “rule of thirds” applies to action shots, probably even more so. Try to make sure that if you’re photographing kids fighting for the ball, place them just off center in the frame. – The dejection or elation on the kids’ faces after the game is over. Of course, when your camera is set on burst mode, you’ll naturally end up with a lot of photos from which you can choose your favorites. Good luck and enjoy it! Remember kids’ sports are all about the fun of the game.